Ichthyosis is a cutaneous disorder characterized by hyperkeratosis of the skin. It is mostly congenital; however, acquired cases have been reported in patients with severe malnutrition. Furthermore, congenital ichthyosis has been associated with micronutrient deficiency such as vitamin D deficiency, resulting in rickets in ∼41% of cases. The two cases reported in this communication were 12 and 11 months old, correspondingly, with congenital lamellar ichthyosis. They had similarly feeding pattern and absence of family history of malnutrition in other siblings, but they developed severe acute malnutrition. The association of congenital ichthyosis with severe acute malnutrition is poorly understood; however, malnutrition has been reported to cause acquired ichthyosis. Ichthyosis is a cutaneous disorder characterized by hyperkeratosis of the skin. It is mostly congenital ; however, acquired cases have been reported in patients with severe malnutrition . Furthermore, congenital ichthyosis has been associated with micronutrient deficiency such as vitamin D deficiency, resulting in rickets in ∼41% of cases ,. It is believed that thickened skin as witnessed in ichthyosis acts as a sunscreen that prevents penetration of the ultraviolet B rays. In the index cases, these are children diagnosed with congenital lamellar ichthyosis (LI) who later developed severe acute malnutrition. The first case was a 12-month-old girl with LI ([Figure 1]). She was delivered as a baby with harlequin ichthyosis, with the membrane subsequently shaded off. However, at approximately the sixth month of life, the mother noticed that she was not thriving. She was predominately breastfeed, with complementary diets made of maize cruel being introduced at the age of 6 months. There were no preceding complaints of recurrent diarrhea. The weight was 6 kg, which was less than −3 Z-score for age; the occipitofrontal circumference was 47 cm; and the length was 70 cm, with a mid-upper arm circumference of 10 cm. Based on these physical parameters, she was diagnosed with marasmus. 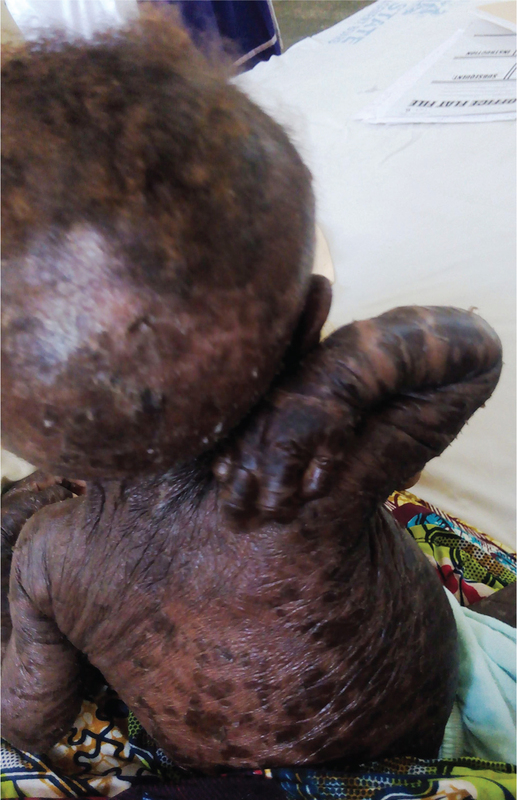 Figure 1 Severe scaling in a malnourished child with ichythyosis. The second case was an 11-month-old boy ([Figure 2]). He was also delivered as a baby with harlequin ichthyosis who was shaded, with subsequently appearance of thickened scales. At ∼4 weeks to presentation, the mother noticed weight loss with painless edema of both extremities. He was predominately breastfed, and maize cruel had just been introduced 2 months before onset of the body swelling. The weight was 7 kg, the length was 69 cm, and the occipitofrontal circumference was 47.5 cm, with mid-upper arm circumference of 11 cm. He had bilateral pitting edema, which was nontender. Figure 2 Ichthyosis with pedal edema. There was no family history of malnutrition in other siblings in both cases, and the pattern of rearing had been the same. Congenital ichthyosis is a heterogeneous disorder characterized by disorder of keratinization resulting in excessive scaling . There are varied inheritance patterns; however, LI is autosomal recessive . They usually present as collodion babies, as was observed in the index cases. However, secondary ichthyosis has been reported in malnourished adolescents and adults, which appears similar to ichthyosis vulgaris. Other systemic diseases that have been implicated include autoimmune/inflammatory disorders, metabolic disorders, and neoplasm ,. Fatty acids play a vital role in the keratin cornification . Therefore, deficiency states as witnessed in severe protein energy malnutrition (PEM) and abnormalities of steroid sulfatase  may result in acquired ichthyosis. The severity depends on the degree of malnutrition and deficiency. However, the mechanism of congenital ichthyosis such as LI predisposing to malnutrition as observed in these cases is not clear. It might have been a coincidence in the index cases, therefore representing a comorbidity of PEM and LI. However, the rearing pattern of these cases was reported not to be different from other siblings, and there were no record of PEM cases among them. However, issues of child neglect cannot be completely ruled out, because disfigurement associated with LI has been associated with stigmatization as was reported by Ibekwe et al. . Furthermore, it has been reported that the loss of the barrier function in patients with ichthyosis may predispose to vitamin D deficiency and calorie loss ; hence, if the calorie loss exceeds intake, PEM may result. Therefore, this calls for further studies to actually establish if there is a direct link between congenital ichthyosis and severe acute malnutrition, as has been observed between severe malnutrition and acquired ichthyosis. Congenital ichthyosis is a rare disorder and is associated with PEM. Micronutrient deficiency and calorie loss has been reported. Therefore, if the calorie intake is less than the extent of loss, PEM may result. The authors certify that they have obtained all appropriate patients consent forms. In the form the patients have given their consent for their images and other clinical information to be reported in the journal. The patients understand that their names and initials will not be published and due efforts will be made to conceal their identity, but anonymity cannot be guaranteed. Oji V, Traupe H. Ichthyosis: clinical manifestations and practical treatment options. Am J Clin Dermatol 2009; 10:351–364. Gupta S, Singh S. Secondary ichthyosis: report of 2 cases. Indian J Med Sci 1989; 43:92–94. Sethuraman G, Khaitan BK, Dash SS, Chandramohan K, Sharma VK, Kabra M et al. Ichthyosiform erythroderma with rickets: report of five cases. Br J Dermatol 2008; 158:603–606. Sethuraman G, Sreenivas V, Yenamandra VK, Gupta N, Sharma VK, Marwaha RK et al. Threshold levels of 25-hydroxyvitamin D and parathyroid hormone for impaired bone health in children with congenital ichthyosis and type IV and V skin. Br J Dermatol 2015; 172:208–214. Vahlquist A, Ganemo A, Virtanen M. Congenital icthyosis: an overview of current and emerging therapies. Acta Derm Venereol 2008; 88:4–14. Joh-Jong H, Ming-Yii H, Tey-Yang H. Lamellar ichthyosis with severe bilateral ectropion and self- healing membrane. Biomark Genome Med 2013; 5:110–112. Dykes PJ, Marks R. Acquired ichthyosis: multiple causes for an acquired generalized distrubance in desquamation. Br J Dermatol 1977; 97:327–334. Polisky RB, Bronson DM. Acquired ichthyosis in a patient with adenocarcinoma of the breast. Cutis 1986; 38:359–360. Elias PM, Brown BE, Ziboh VA. The permeability barrier in essential fatty acid deficiency; evidence for a direct role for linoleic acid in barrier function. J Invest Dermatol 1980; 74:230–233. Sakura N, Nichimura SI, Matsumoto T, Ohsaki M. Frequency of steroid sulfatase deficiency in Hiroshima. Acta Paediatr Jpn 1998; 40:63–64. Ibekwe PU, Ogunbiyi AO, Ogun OG, George AO. Social stigmatization of two sisters with lamella ichthyosis in Ibadan, Nigeria. Int J Dermatol 2012; 51:67–68. Orphananesthesia. Anaesthesia recommendations for patients suffering from lamellar ichthyosis. Available at: https://www.orpha.net/data/patho/Pro/en/Lamellar_ichthyosis_EN.pdf. [Accessed 12 January 2016].